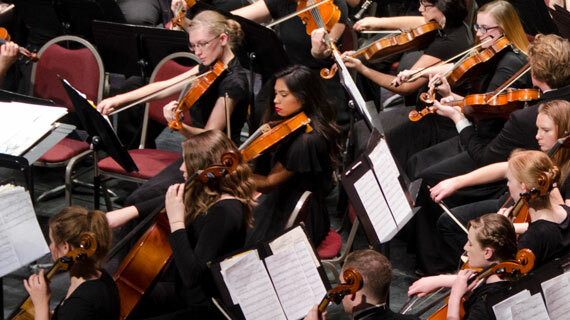 The SUU Department of Music will team up with high school students throughout the region to perform the SUU High School Honor Orchestra Concert. This concert will be held on Saturday, September 22, 2018, in the Heritage Center Theater at 5 p.m. and is free and open to the public. Dr Christian Bohnenstengel, who serves as the Director of Keyboard Studies at SUU, will be featured as a guest soloist. High school students, nominated by their directors participate in an outstanding opportunity to rehearse and perform with the SUU Symphony Orchestra. The students then study high quality orchestral works under the direction of Dr. Xun Sun, Director of Orchestral Activities at SUU. Their hard work culminates in the final concert. Works performed will include, Beethoven’s Coriolan Overture, op. 62, Franz Liszt’s “Piano Concerto No. 1, 1st Movement”, and Shostakovich’s “Symphony No. 5, 4th Movement”. Dr. Sun, Director of Orchestral Activities at SUU, says, "Music is a universal language. It addresses concerns about human feeling, emotion, thoughts, and how we sense the world. Music communicates hope for people. Symphonic music has its own unique artistic format and power to express those feelings, emotions, and thoughts. It is important for people, no matter who they are, to learn and understand this language. SUU provides this specific opportunity to teach high school and college students this musical language and to share their vision of the future." Dr. Christian Bohnenstengel earned his Master of Music and Doctor of Musical Arts degrees from the University of Nebraska-Lincoln. He has performed on public radio and presented at state, regional, national and international conferences. Dr. Bohnenstengel is a founding member of Southern Utah University’s Faculty Jazz Combo Kind of Blue and frequently performs with Jazz ensembles and musicians throughout southern Utah. His performances have taken him all over the United States, South America and Europe. Celebrate the language of music at the SUU High School Honor Orchestra Concert with high school and college students from the region. For more information, please visit www.suu.edu/pva/music.